The kids can also enjoy feeding the chickens, ducks, Guinea fowl and turkeys whilst our gentle giant "Varky" Loves a gool ol scratch and mischievous "Bokkie" enjoys a carrot or two! The fun is at The Farm! The Farm is a fully fenced and secure area. Parents can sit and enjoy a cup of coffee whilst keeping an eye on the little ones who explore one area at a time. When you book your child's next Birthday Party at The Farm Kids Party Venue, you can have peace of mind you are booking exclusive use of the entire venue, so you can relax and enjoy every moment. We allow 30mins set up time prior to the party and 30mins take down after the party. 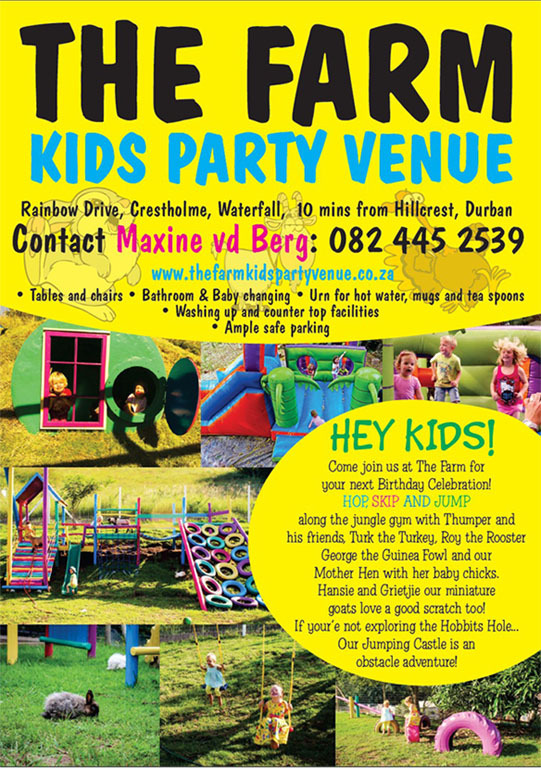 The Farm Kids Party Venue is situated in the tranquil country setting of Crestholme, Waterfall. We are located only 10 mins from Hillcrest CBD, with tar roads all the way we are easy to find. Easily accessible from Kloof and surrounding Upper Highway areas too. Come join us at The Farm for your next Birthday celebration! Your kids will have endless fun playing on our jungle gyms amongst the rabbits, climbing the Tower to get a birds eye view like our Macaws or go underground exploring the Hobbits Hole. When you book your child's next Birthday Party at The Farm Kids Party Venue, you can have peace of mind you are booking exclusive use of the entire venue, so you can relax and enjoy every moment. We allow 30mins set up time prior to the party and 30mins take down after the party. We look forward to seeing you at The Farm! Bookings Essential!